We have all been impacted by high drug prices in one way or another, but in the US we regard this as a necessary evil, just the way that things are. However, when Kunal went to India recently, he was surprised by how cheap the eyedrops that he used were. Originally, he thought that this was because the eyedrops were generic or knock offs, but they were they exact same brand he used in the US, at 1/10th of the price. Intrigued, he researched the feasibility of importing prescription drugs into the US, only to find that this practice was illegal. However, given the fact that many of the drugs in the US are made in India and other non-domestic nations, we felt that this was a somewhat overstated risk. We wanted to show the magnitude of savings possible, so we decided to create Hippocritical to raise awareness for this issue. Hippocritical is an online platform that fosters international health through greater freedom of information. By integrating a number of unique databases, this website can demonstrate differences in price between the U.S. and India, in order to raise awareness and advocate for change. The data, and thus the website, tells a story: look up a drug and see the difference between the two countries. The same drug, often by the same manufacturer, with drastically different prices. 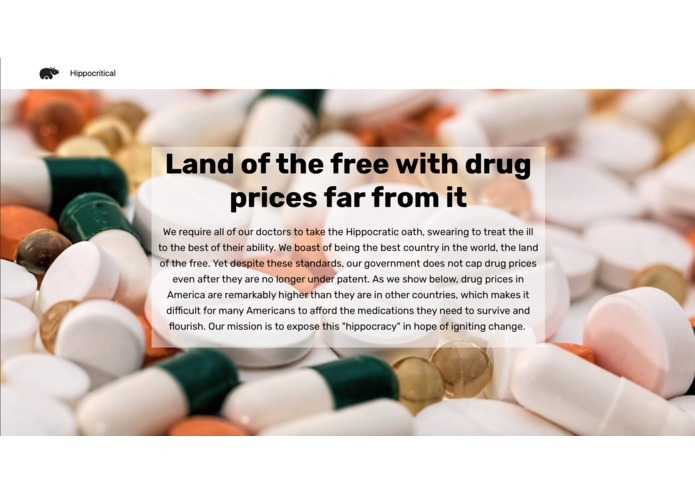 Hippocritical sheds light on America’s hypocrisy - advocating for freedom but having drug prices too high for some of America’s most vulnerable. Integration proved incredibly challenging as we worked on this project. Simply acquiring data was difficult, as few datasets existed and almost none were open source. Luckily, we were able to find a series of United States national databases and a single Canadian one, creating our almost seven million data point model. Including data scraped from Indian websites, we saw the beginnings of the dataset we ultimately used. Bringing all this data together proved difficult. There was the simple case of different units being used in different countries, and more complex nuances such as different names referring to the same drug or different standard dosages across political boundaries. We solved this by including a backend “dictionary” that correlated drug names between countries - another U.S. government dataset find - and only including data with similar dosages. At this point, we had a lot of data and optimization became a necessity. Latency upwards of ten seconds between querying the combined database and receiving a response was not uncommon. Our first decision was to optimize our code, using techniques of abstract code analysis - including Big-O, to find the fastest coding algorithms. From there, we moved away from on demand data scraping and instead saved all data internally. Finally, we started to cut down the number of observations we had. We excluded any observations that were not the most up to date (i.e. where type and dosage are constant but date surveyed has changed) and those that could not be correlated between datasets (i.e. drugs that are only used in one country and not another). Above all else, we are proud of the project we’ve created. None of us have ever been to a Hackathon before and were daunted by the quick turnaround. Being able to put something forward that accomplishes the goals we originally set out for gives us incredible pride. Within Hippocritical, we are proud that we were able to code for good - creating something that we are all truly passionate about. Beyond that, we worked as a team in a high stress environment - developing a project by learning on the go and working together! Undoubtedly, we learned the value of teamwork. No one of us could accomplish the entire task, especially with the time constraints. We heavily relied on delegation and team decisions to drive Hippocritical forward. Moreover, we had to break free of our comfort zones. At some points, either frontend or backend had substantially more work than their counterpart, forcing us to be flexible enough to learn a new skill on the fly and implement it in real time. This mental agility is very rarely taught in schools but is a major takeaway from this event. Our technical skills undoubtedly improved, with some of us being exposed to new packages or styles, but the soft skills are truly the unique takeaways that can only be learned in an intense but constructive environment like HackDuke! Here at Hippocritical, we are passionate about promoting equality of care regardless of financial means. We hope to build on this project, adding more datasets, including the Ontario Drug Benefit Formulary / Comparative Drug Index (ODBF/CDI) and the Common European Drug Database. By extending our reach, through more comparisons, we can better represent the discrepancy between the United States and other countries. With more data and time also comes the opportunity for advancements in data analysis, allowing for visualization and regression analysis that was unfeasible during our limited time at HackDuke. We’re looking forward to continuing this project’s development! We want Hippocritical to mean something - we want the code we create to produce action. As a result, we hope to reach out to both citizens and politicians across the country, using our code as a foundation for education on the issue. Through the education and discussion fostered by our website, we hope to truly code for good.